The statistic shows the global youth unemployment rate from 2009 to 2014 with a forecast up to 2019. 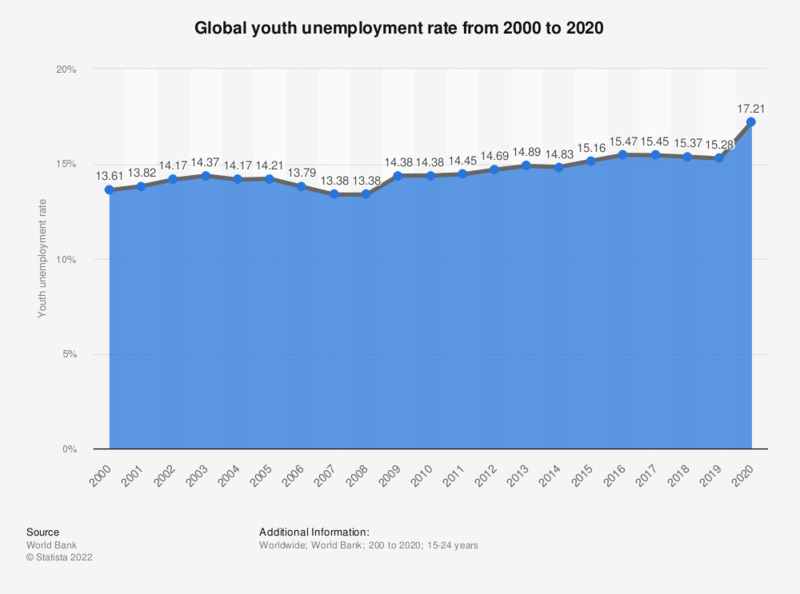 The global youth unemployment rate was at 12.9 percent in 2012. Just like the general unemployment rate, youth unemployment is recorded and monitored to gauge the job market situation in a country and worldwide. Youth unemployment includes unemployed individuals aged 15 to 24, a typical age range to have either just finished school or graduated and looking for jobs. In order to be registered as unemployed, a person must be able to work, unemployed and looking for a job. Usually youth unemployment is higher than adult unemployment, since many graduates do not find employment right after they have graduated. According to the development of youth unemployment in regions of the world, the rate is the highest in the Middle East, as is the general unemployment rate worldwide. To escape unemployment, it has become quite common in some parts of the world to leave ones hometown and look for work elsewhere. A look at youth employment prospects by country shows that optimism among young people in finding a good job is decreasing even among those who are not unemployed; especially in the countries struggling due to the economic crisis, hope to find a job that pays better than the current one to enable the young employees to live a better life than their parents is practically non-existent. Still, even though the global youth unemployment rate has been increasing slightly over the last few years, it is projected to remain stable in the future.